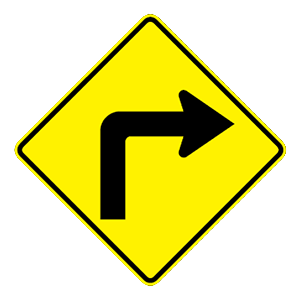 There is a sharp turn to the right. 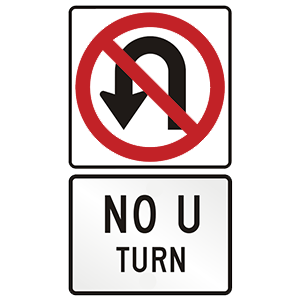 The lane must turn right. A right turn is permitted on a green arrow only. Some warning signs have a fluorescent yellow-green background. 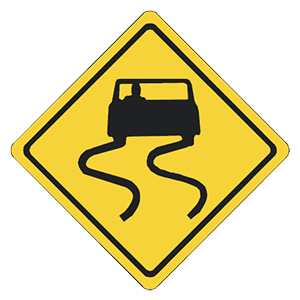 These signs warn of upcoming conditions, including roads with curves and sharp turns. Driving as closely to the right edge of the road as possible and stopping. Moving into the right lane and driving slowly until it has passed. Stopping immediately, even if you are within an intersection. You must yield the right-of-way to any emergency vehicle that is using its siren and flashing lights. Do this by driving to the right edge of the road and stopping, taking care not to stop in an intersection. You may move again after the emergency vehicle has passed. Which of these is a safe driving technique? Using your high beam lights in the fog. Staring at the road ahead of your vehicle. Checking your rearview mirrors frequently. To stay aware of hazards, you should scan the road and check your rearview mirrors every two to five seconds. Constantly staring at just the road ahead of you is dangerous. If you must drive in foggy conditions, you should use your low beam headlights, not your high beam headlights.